If you have ever watched the English comedy show titled Russell Howard’s Good News, then chances are that you will also know the man behind the show. His name is Russell Howard – a British born comedian, radio and television presenter. Russel’s show came to light in 2006 and gained fast popularity, eventually, it was voted as the Best Show ever on the BBC 3 network. He is also popular for the show titled The Russell Howard Hour. The veteran comedian has sited notable comedians like; Richard Pryor, Lee Evans as well as Frank Skinner as his source of inspiration. Learn more about him below. Russell’s date of birth is the 23rd of March 1980, he was born in Bristol, England with the given name Russell Joseph Howard. His parents Ninette and Dave Howard raised him in England alongside his siblings – twins Kerry and Daniel Howard. His zodiac sign is Aries. On his educational background and qualifications, he achieved his early education at Perins School, New Alresford Hampshire and proceeded to Alton College which is also in the same city. Howard later enrolled at the University of the West of England Bristol where he majored in Economics. His professional career took off on Milk Run – a BBC series where he wrote, as well as performed. He later moved into full-time comedy which he constantly employs as a platform to raise crucial sociocultural issues like; Sexism, self-harm, as well as homelessness. At the onset of his career, he put in an effort as a steady panelist for the popular television show titled Mock the Week. Russell has since appeared in some other comic shows like; Would I Lie to You, 8 Out of 10 Cats, Live at the Apollo, Chris Ramsey’s Stand Up Central and Russell Howard & Mum: USA Road Trip. Apart from comedy, Howard is a diehard soccer fan, he was already an enthusiastic devotee of Liverpool Football Club by the time he was 10 years old. Before his foray into comedy, he was a player for Basingstoke Town Football Club – a member of the Southern League Premier Division. Russell Howard is also part of ‘Friends of the Earth International’ – an environmental organization. He was involved in the London marathon in a bid to raise funds for the epilepsy society. The comedian does not believe in the existence of God and he said so in his 2014 stand-up tour DVD titled Wonderbox. Russel has also appeared in a couple of films like Rome & Jewel and A Gert Lush Christmas. He has an award and a nomination to his credit, at the Chortle Awards of 2006, he won Best Compere, while his Edinburgh Festival Fringe show of 2006 earned him a nomination for an Edinburgh Comedy Award. Russell Howard’s accumulated net worth is recorded as $9 million by some trusted sources. His wealth skyrocketed in just a couple of years with a healthy earning of $4 million. In the past year, his company recorded a profit of £2.5 million about $2.5 million which came mainly from the sale of his DVDs as well as television deals. Russell is the owner of a 5-bedroom house located in Leamington Spa which worth is £600,000. Russell Howard was born into a typical English family, his parents Ninette and David Howard aimed for their kids to be properly educated. They have two other children – Daniel and Kerry Howard who are twins, but Russell is the eldest among them. His sister Kerry grew up to become an actress. His brother Daniel suffers from epilepsy. A closer look at his relationship record revealed that he is in a romantic entanglement with Cerys, a medical practitioner, with whom he has been going steady with since they were teenagers. Russell met his girlfriend at Ventura Scout Disco when they were still in their teens, Cerys is his friend’s younger sister. 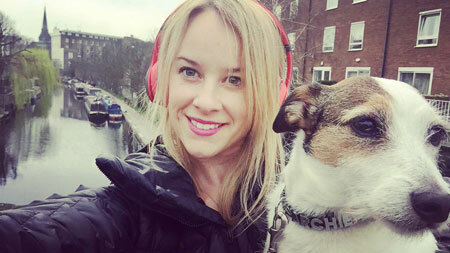 The duo currently lives together in Camden, London along with their pet dog Archie – a Jack Russell Terrier. Their relationship looks solid and they have been steadfast for many years and counting. On the 25th of December 2018, in an interview section on Alan Carr’s Christmas Cracker, the comedian revealed that they would be taking their relationship to the ultimate spot in 2019. Their wedding is highly expected by fans and the general public who have been predicting that it will soon come to pass.